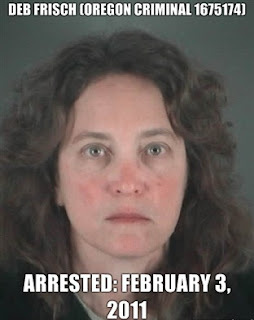 on Friday, Deborah Frisch was returned to jail, where she spent the weekend. Teh YAY! Unlike last year, when Miss Debbie tried to beg for free booze for Super Bowl Sunday, all signals indicate Miss Debbie was trapped in a concrete cell for teh weekend, muttering to herself about "grown men kicking dead pigs around." It's unknown when--or even if--Miss Debbie will be released today.